When you own an original Hummer, you get a lot of questions. Why is it so big? Why do you need a vehicle like this? Do you have any regard for the environment? Are you a complete idiot? Well today, you’re in for a treat, because I’ve decided to ignore all of these pressing issues and instead tell you how I get my Hummer serviced. For those of you who aren’t sure why this might be a topic of interest, allow me to explain: Hummer no longer exists. In fact, Hummer hasn’t existed since the Great Recession, when the kind of people who purchased Hummers saw their Las Vegas-area construction businesses fail because property suddenly had approximately the same value as an extension cord. This unfortunate situation forced these people to buy much more reasonable vehicles, such as used Cadillac Escalades. More than that, the original Hummer no longer exists. Later Hummer models, imaginatively named the H2 and H3, shared many mechanical components with General Motors vehicles like the Chevrolet Tahoe and Chevrolet Colorado. But my Hummer, the original Hummer, the “big dawg,” as I call it whenever I’m wearing my camouflage baseball cap, hasn’t been made since 2006. Dealers don’t sell them anymore. Customers can’t buy them anymore. And the factory that once made them now builds the Mercedes-Benz R-Class, which is a luxury minivan that is no longer sold in America. This is a great shame, because it would’ve been a huge hit with our fine nation’s Uber drivers. But here’s the thing: even though they don’t build the original Hummer anymore, and even though you can’t buy an original Hummer anymore, my original Hummer still breaks down. You’d know this if you followed me on Twitter, because I once posted a picture of my Hummer sitting forlornly on the back of a Triple-A flatbed tow truck after it failed to start one Sunday afternoon. 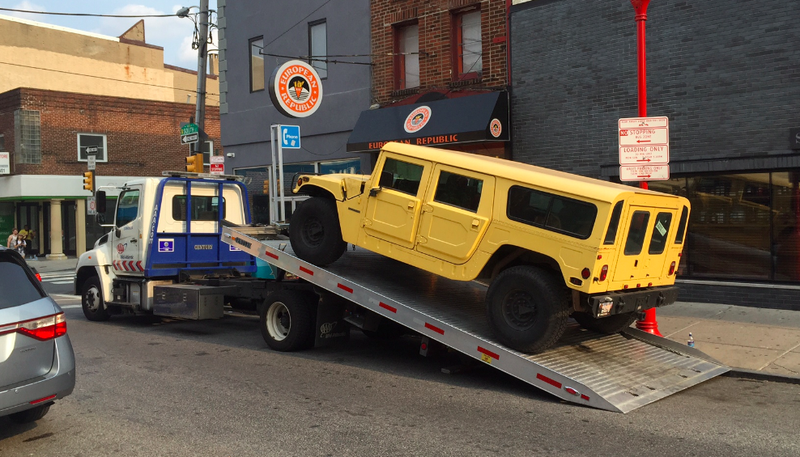 But this begs the question: once you’ve loaded your Hummer on a flatbed, where the hell do you take it? The short answer to this question is Turnersville Chevrolet, located in the Turnersville Auto Mall, home to every car brand you could possibly want, and also Scion. First and foremost, it’s important to note that there are still a lot of factory-trained Hummer technicians peppered throughout the country at various dealerships. These were people who were trained on Hummer years ago; people who were flown to Indiana to learn how to disassemble a machine gun turret; people who still have their grease-stained 1990s Hummer training manuals with happy Clipart Hummer owners on the cover. Believe it or not, finding one of these people is easy. All you have to do is visit AM General’s surprisingly professional website, go to the service provider page, type in your ZIP code, and BOOM! This is when you discover the name of the dealer who will have your Hummer for the next several weeks as they wait for parts. I first visited Armen right after I crushed the PT Cruiser, when I knew my Hummer had a laundry list of issues to address thanks to a pre-purchase inspection I carried out before I bought it. There was a loose this, a leaking that; a stuck this, a worn that. It was going to be expensive. But little did I know exactly how expensive it would be. When I arrived at Armen, I discovered it had previously been a proud multi-brand dealer, home to franchises for Cadillac, Saab, and Hummer, and service departments for each. Unfortunately, Saab and Hummer disappeared, leaving the dealership to carry on as a shadow of its former self: aside from a litany of new Cadillacs inside and outside of the showroom, there were a few inexplicable Buicks and Chevys randomly strewn around. It looked like the kind of situation where your mom might yell at you to clean your room, except in this case “your mom” is the General Motors Northeast Region Vice President, and “your room” is a six-acre automobile dealership. I also got the impression that the service department was rather desperate for business; so desperate, in fact, that they would work on anything, whether it was Saab, Chevy, Cadillac, personal watercraft, riding lawn tractor, etc. Unfortunately, I also discovered that Armen has something of a monopoly on the Hummer service business in the wealthy western Philadelphia suburbs. I say this because I dropped off my Hummer and learned that they are quite thorough. VERY thorough. So thorough that I kind of wonder if maybe the technician thought I was planning on shipping this thing to Afghanistan, where I would cruise around fighting insurgents on my own dime. Two days after I dropped off my Hummer, the calls started coming in. There were more issues than I expected. It was going to cost more than I thought. A few hundred here. A few hundred there. In the end, my first service cost nearly $5,000 – around $2,000 more than I had worked into the price when I bought it. But when I went to pick it up a few weeks later, the service advisor was nonplussed. “We see this all the time,” he said. Then he asked the next customer for the mileage on his riding lawn tractor. So when my Hummer broke down a few weeks ago, I knew I had two options. Number one, I could return to Armen, where they would tell me the Richenhagen Spindle is worn and it would be $1,150 and two weeks in a three-year-old Malibu with a vanity plate that says “ARMEN.” Or I could log back on to the ol’ find a Hummer service provider website and roll the dice again. And this is how I found myself at Turnersville Chevrolet. Now, initially I was a bit uncertain about whether I should leave my Hummer at the Chevrolet dealership. I say this because I have a very rare gas-powered Hummer, and as I was walking out to it to demonstrate my problem to the mechanic, he – a trained Hummer technician with many years of experience – turned to me and said: “I didn’t know they made ‘em with gas engines.” Imagine your Honda Accord technician coming up to you and saying: I’ve never seen one with VTEC before! But in the end, it turned out to be the right decision. I know this because a few days later, I got a call from the service advisor, who insisted she had some “bad news” for me. What would it be? Thousands of dollars for a new transmission? Even more for a new engine? The Richenhagen Spindle went out of production eight years ago and they would have to create a new one using high-grade titanium only found in a Chinese factory that was currently on strike? …and then she paused, waiting to deliver the blow, like a doctor giving a cancer diagnosis to a guy who won’t live long enough to see the Trump candidacy implode. Needless to say, I have now found my official Hummer service department. I wonder if they’ll work on imported Nissan Skyline GT-Rs.